We arrived in Indio just before 11 pm last night. We found a good Wal-Mart and stocked up before heading toward Joshua Tree National Park. Had I entered through the South entrance, it probably would have saved me 60 miles on my trip, but I picked the West entrance. After asking the advice of a ranger, Petey, VANilla, and I immediately searched out a campsite at Jumbo Rocks. 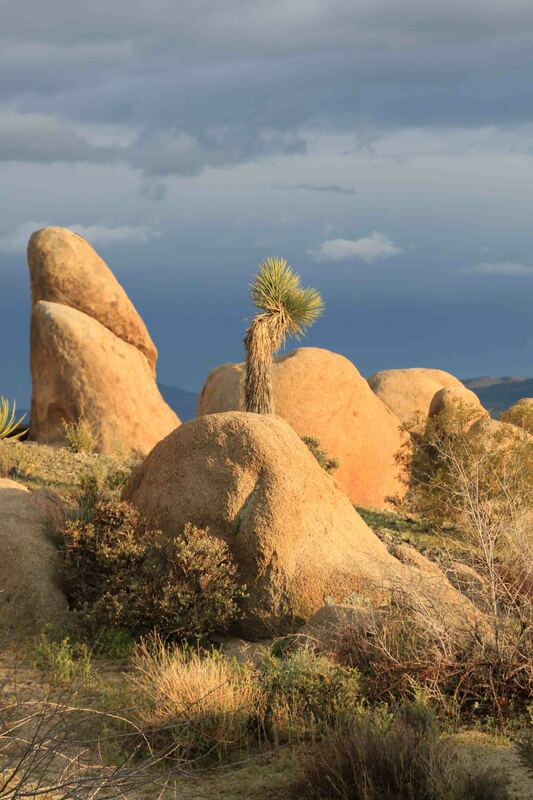 Joshua Tree National Park, so named for the Joshua trees scattered all over the area, boasts nine campgrounds. Hidden Valley is the most popular among the climbers and Ryan and Jumbo Rocks are the two that are in the middle of everything. We pulled into the camping area where I always like to look at the campground map while I scope out a sight. It’s particularly important to me to find a site near a bathroom. No map was available, so we putted along at 15 mph looking at the parking spaces on the side of the road. The parking spaces were sites. I couldn’t believe it. Imagine driving into a shopping center with boulders replacing stores, pulling into a parking space marked by wood post with a clip to attach a reservation slip, and then camping there. Based on the sites, I quickly deduced I will be without electric, the bathrooms will be pit toilets, and I’ll have to rely on my own water. BINGO! REALLY…SNOW!!! I’m done with cold weather. I came to California for SUN!!! Joshua Tree National Park doesn’t allow dogs on the trails, so Petey and I took a walk around the campgrounds before I ventured off on a mile walk to Skull Rock. 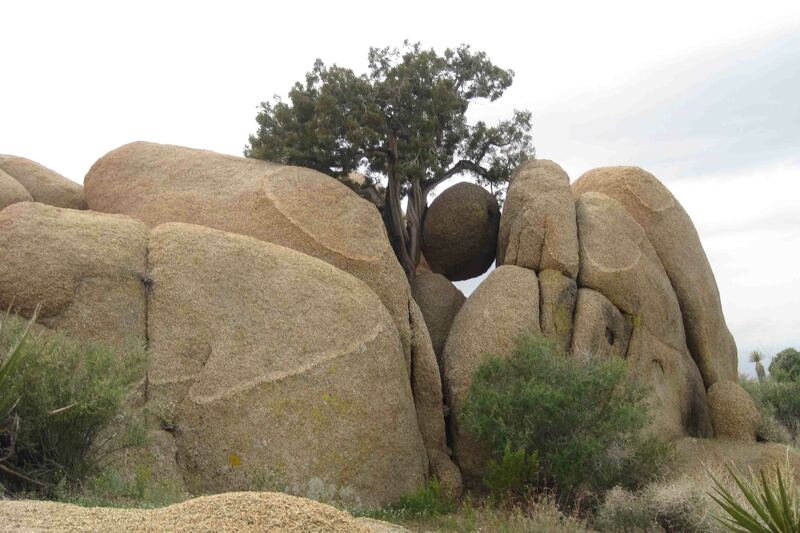 Several boulders were in the area. 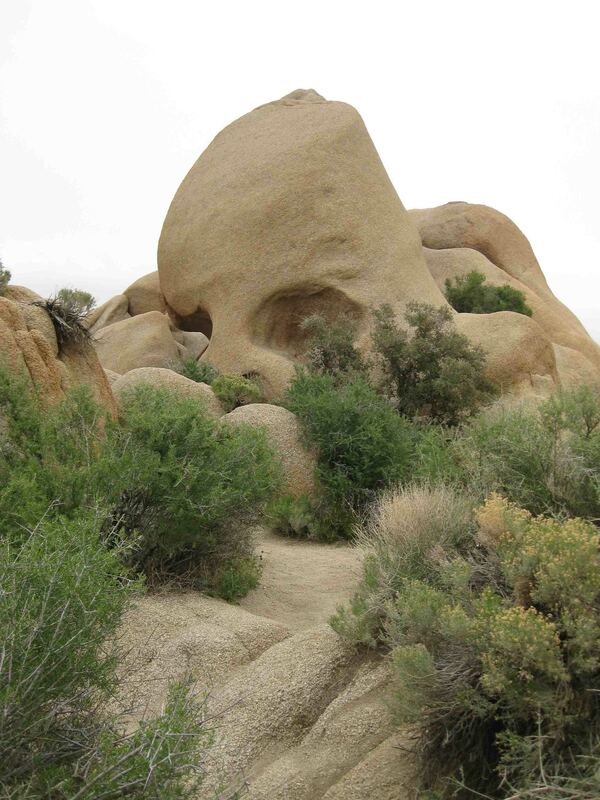 I was hoping I wasn’t just passing by the rock that was supposed to look like a skull. Sometimes, like in Sedona, I don’t see the resemblance between the rock and the animal for which it is named. Skull Rock turned out to be unmistakable. As I ducked under the desert oak and turned the corner, there it sat staring at me…EERIE! 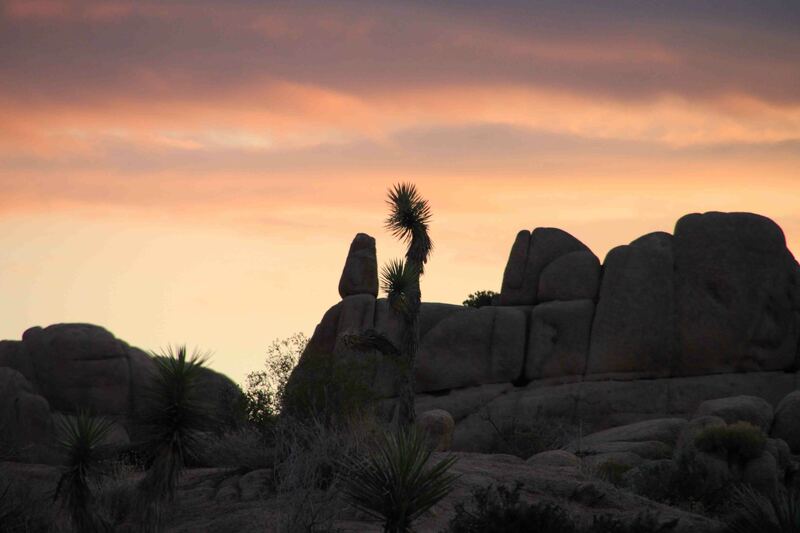 After taking a little time to climb around the rocks, I retraced my steps to the campground as I snapped a few photos of flowering cacti. Petey, VANilla, and I went to explore other areas of the park while enduring intermittent rain showers which helped keep the temperature somewhat cool. 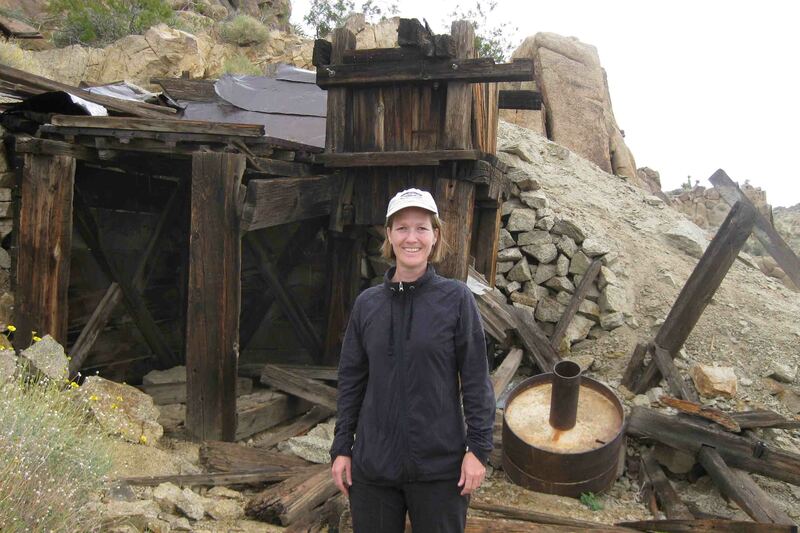 First we stopped at a few roadside exhibits, one being the Silver Bell Mine. The tipples of the mine still remained. 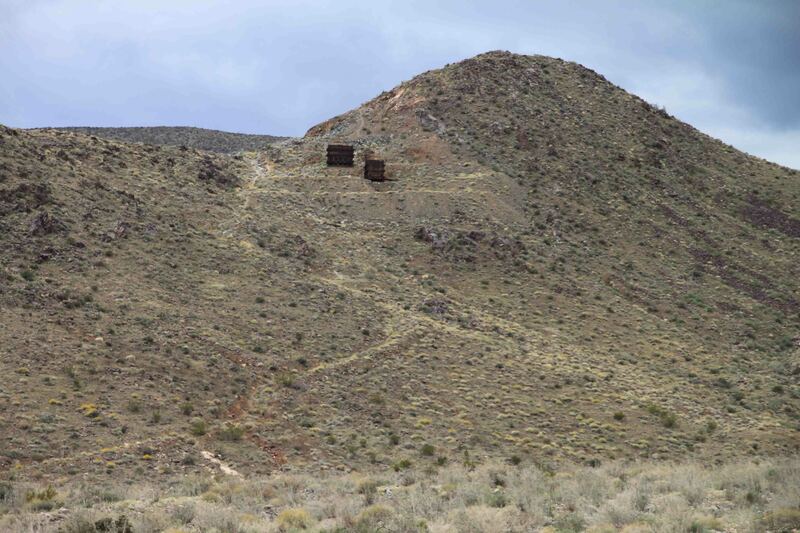 According to the sign, “These ore bins held and fed rock to stamp battery that crushed the ore into a sandy, watery pulp and pushed it on to an amalgamation table where the precious metal was extracted.” The mine operated 40 years and produced gold in the 1930’s, lead in the 1940’s, and copper in the 1950’s. 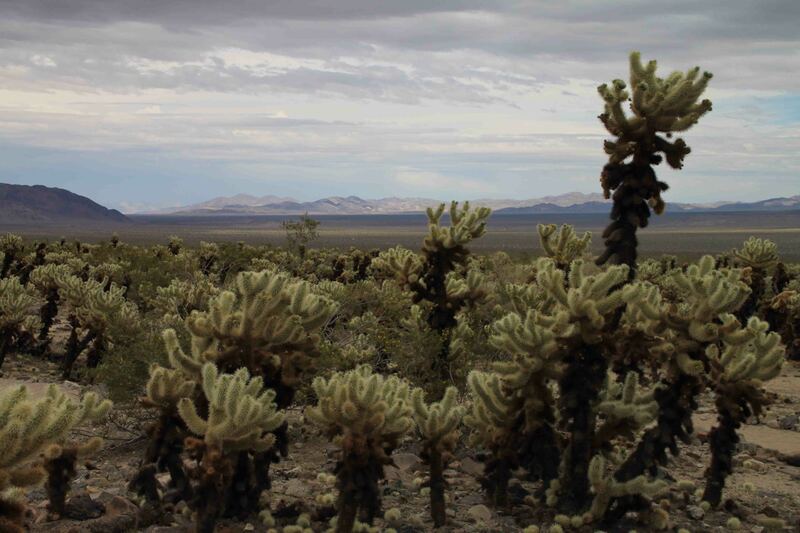 Next we visited the Cholla Cactus Garden. There were so many in this particular area, it looked as if the park rangers had planted a garden of these cacti…not so. A few of them were blooming. I can’t imagine what it would look like when they were all blooming. 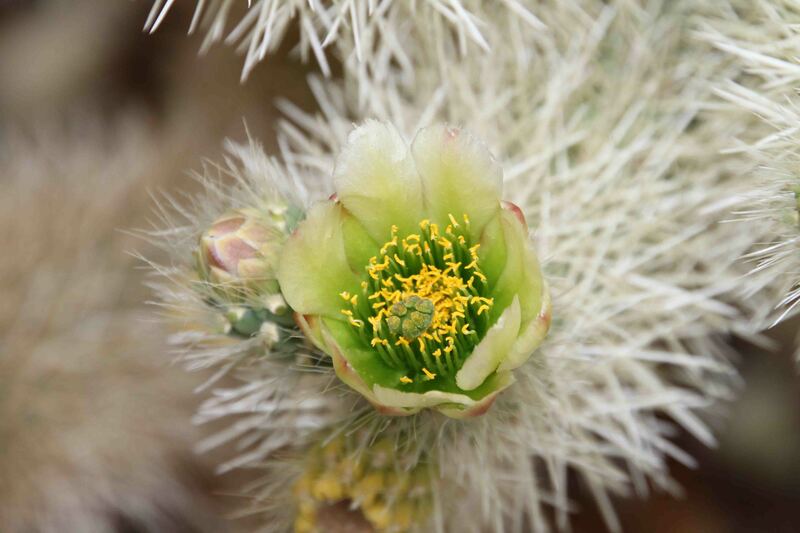 The bud appears yellow on the outside, but when it opens the “petals” are almost translucent. 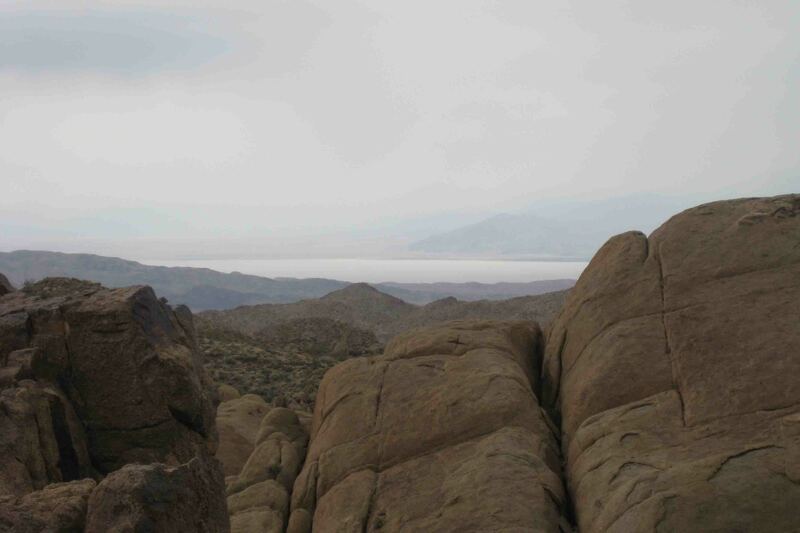 As we crossed the two different deserts, the Mojave and the Colorado, the terrain changed. 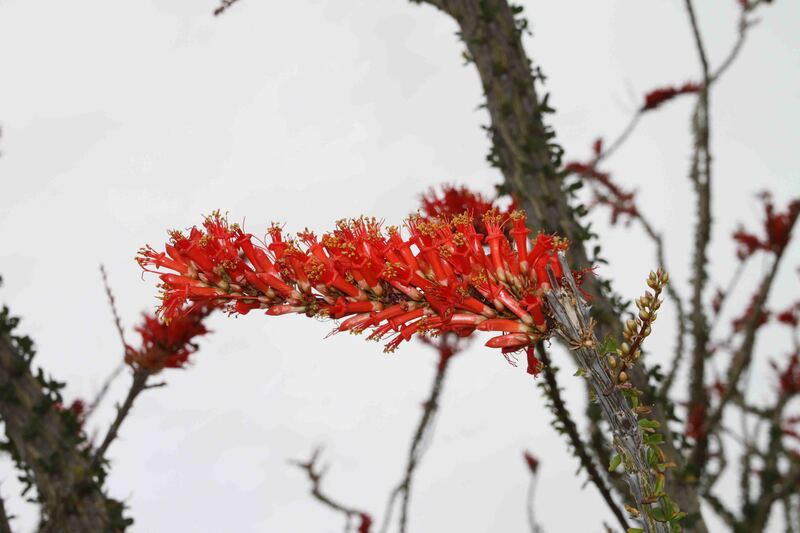 Instead of Cholla, the land was peppered with red, flowering Ocotillo. 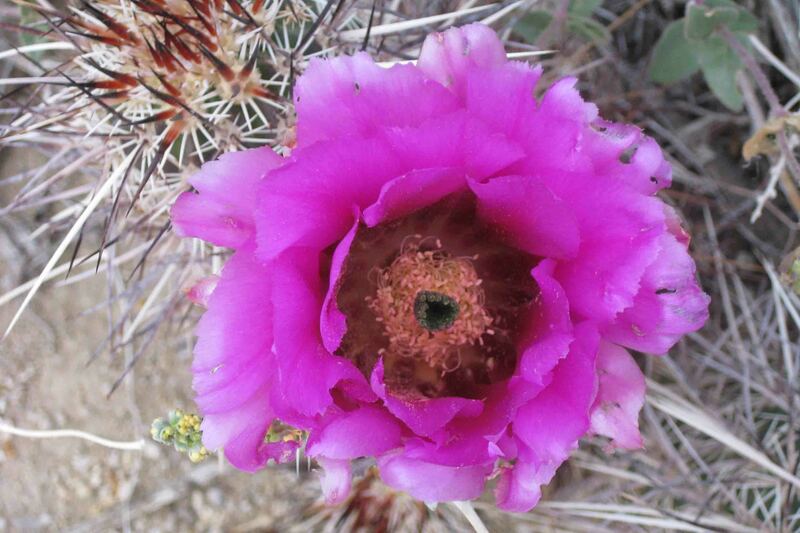 While it looks like a cactus, it isn’t. 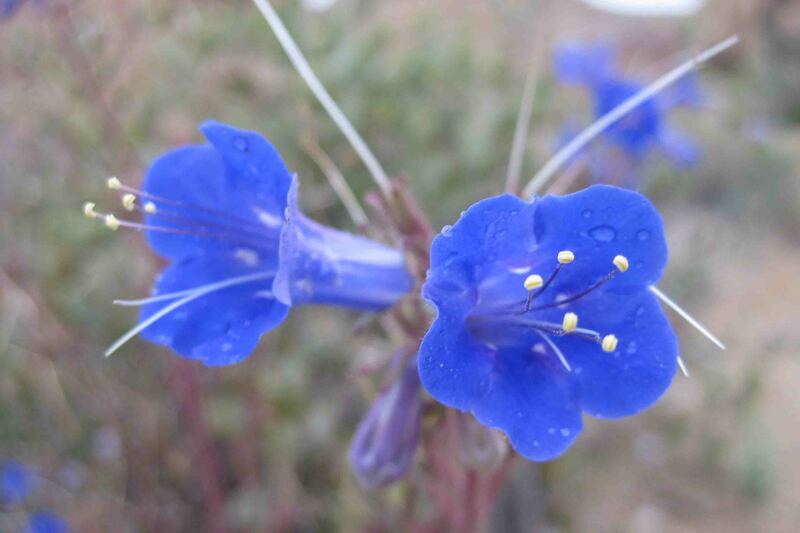 “The thorny, multi-stem shrub is a woody, deciduous plant”. Normal deciduous plants grow leaves in the spring and drop them in the fall. 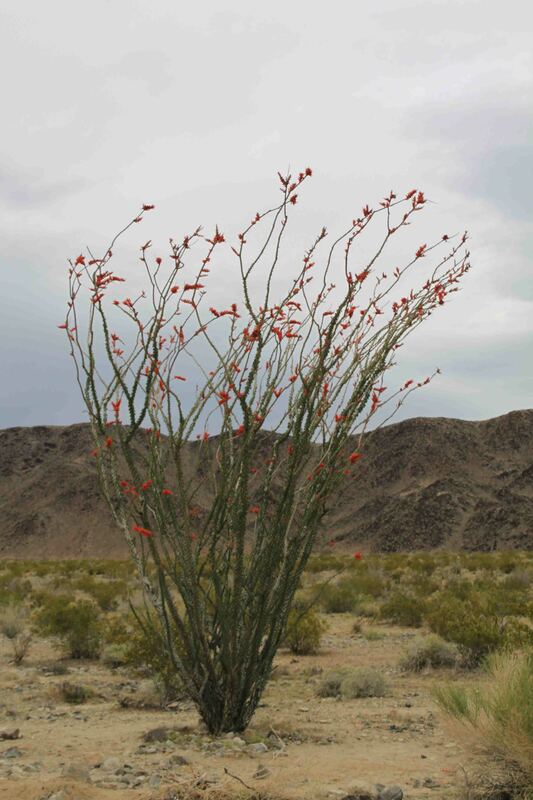 The Ocotillo, however, may grow and drop its leaves up to five times a year, as it is dependent on rain, not the seasons. After 30 miles of driving south through the park, we reached our hiking destination, Cottonwood Springs and Mastodon Mine and Peak, a 2.4 mile loop trail. 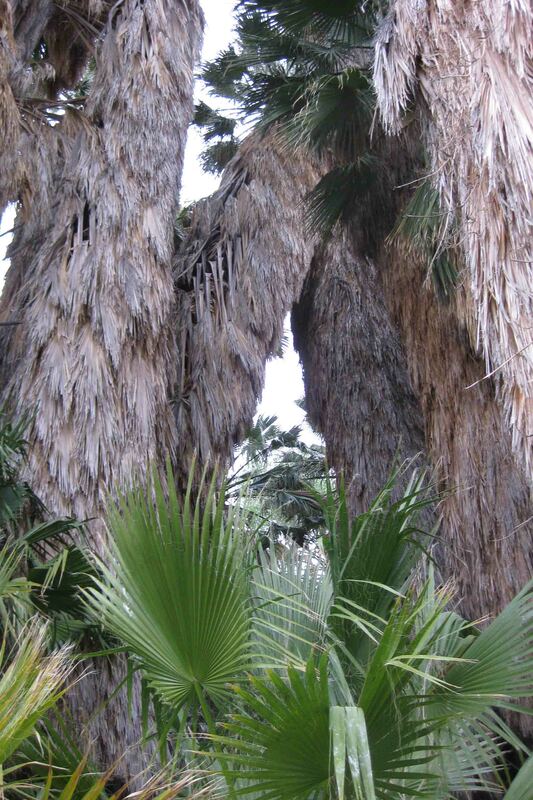 I didn’t see any water in the springs, only surrounding palms; but Indians, cowboys, miners, teamsters and other desert travelers did. The miners made the biggest changes to the land. They constructed roads, piped water to the mines, and built an arrastra nearby which is a drag-stone mill for crushing ore. 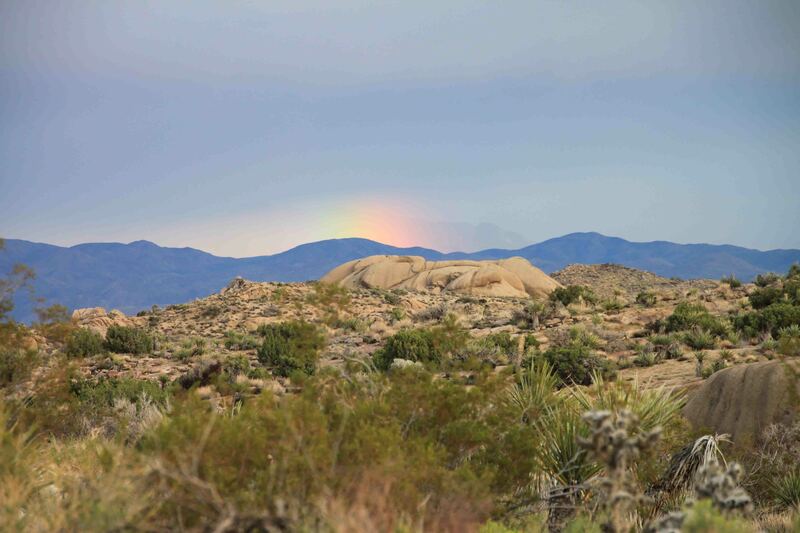 I passed by the springs, several flowering cacti, and an array of stones and boulders, as I slowly climbed up to Mastodon Peak where the Mastodon Gold Mine was located. The mine was worked off by the George Hulsey family from 1934 until 1971. The shaft is closed off to visitors, but other remains stand nearby. I hiked the loop in a constant drizzle and met a family of four from Oregon who were used to the weather. They said if they didn’t go out in the rain, they’d be inside for nine months…I don’t think I could live there. It was close to five when I finished the loop…Petey was very happy to see me. 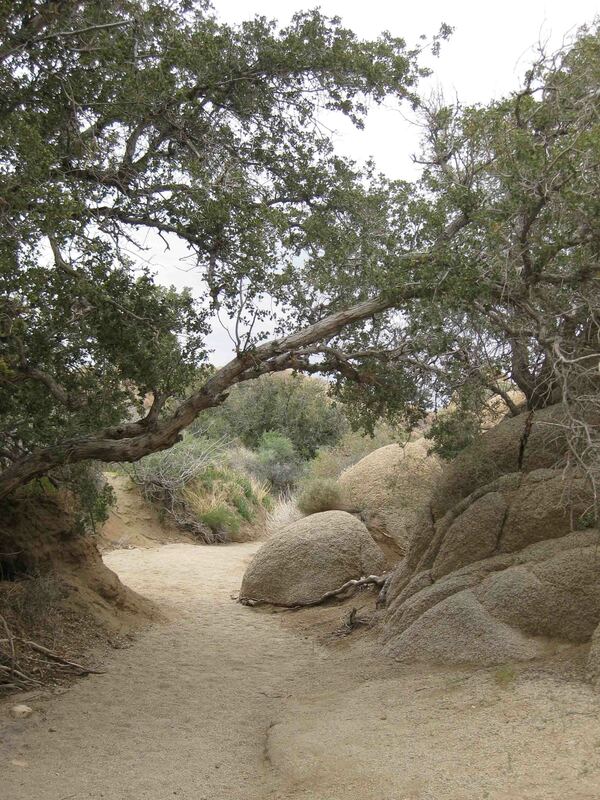 We returned to the camp ground and stopped at the last hike of the day…A short stroll along the Arch Rock Trail by White Tank Campground. 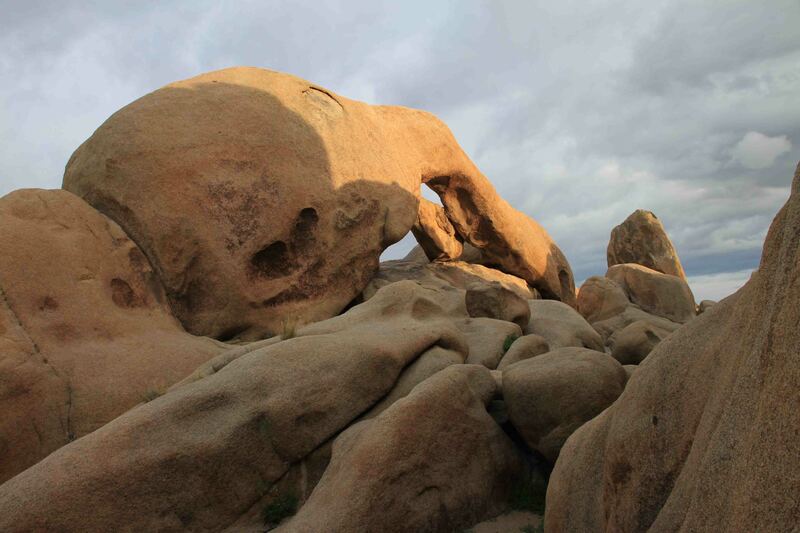 The arch was formed from the wind, rain, and temperature dissolving the minerals of the rock. 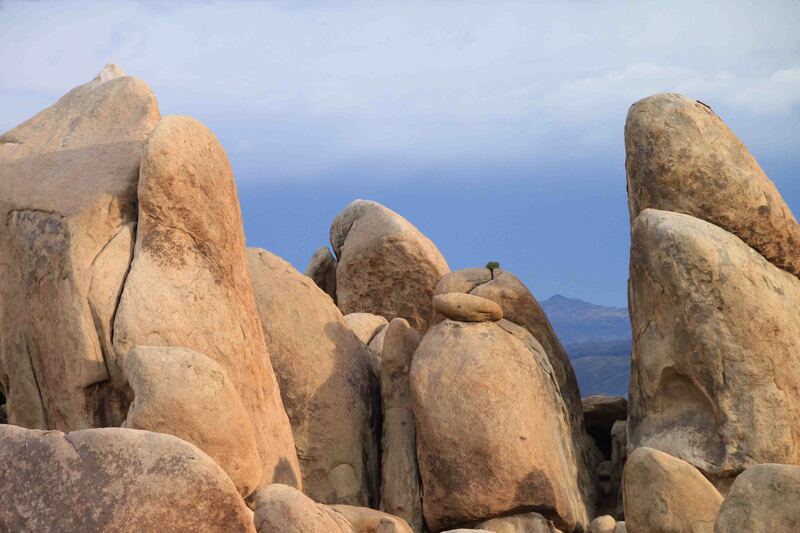 Interesting rock formations surrounded the area which made for a nice evening stroll. I haven’t seen your mother post in several days. She must be on the road somewhere or in Colorado. For some reason WordPress has blocked her iPad. She has to get on computer. Great pics! Love the flowers, rocks, and the rainbow. Super fun!